So, after a lot of research (you did research, right?) you’ve decided on a turtle because it seems like a pretty easy kind of pet to own. You might be surprised to learn this but actually if you're buying this "turtle" from a UAE pet store, you may well have got yourself a terrapin (yes, we know, very technical... but they aren’t called "turtles"!). Terrapins are a species of semi-aquatic turtle originally found in coastal swamps in Southern United States. The most common breed of terrapin sold throughout the UAE is the Red Eared Slider (RES) which can be identified easily by its... you guessed it... red stripe behind each eye. Terrapins as pets are great for people of all ages and you probably already know, with all that research you did (right? ), that the ins and outs of owning a terrapin are far from hassle-free and that they aren’t the easy-going pet most people perceive them to be. But then what pet is? No matter how small and cute these little guys are (for now), they actually take a lot of time and effort to properly take care of, but like any pet, once you’ve established a routine it’s a walk down easy street. You will spend a small fortune in the initial set up of their "house" and you’ll actually need a lot more than just an aquarium, some rocks and water! As an owner of a terrapin, you can now call your tank a terrapinarium (fancy, eh?) and the ideal size of tank to start with would be one approximately 200lt in volume for a couple of terrapins (yep, all this for just two teeny little terrapins… remember they grow! ), along with some rocks and logs for their oh-so important sun basking, a water filtration system, a heater, and a UV light to help maintain a comfortable body temperature - and all this just to start with. Then there’s the food! And as you know (from the research, right?? ), terrapins are cold-blooded animals and a proper heat source is vital for their survival, along with a pool for them to swim in with both deep and shallow areas. With all the research you’ve done you’ll also know that terrapins are carnivores and just loooove shrimps, small bits of meat and insects, but it’s also important to supplement their diet with vitamins and calcium which will keep them healthy inside and out. Although terrapins are really cute, they can make a bit of a mess between all their eating and pooping, and this will keep you busy cleaning the tank throughout the week (yikes!) in order to keep their environment clean and hygienic, especially if you don’t have a water filter! The amount of time you spend cleaning is, of course, impacted by the size of the tank, how many terrapins you have and the efficiency of your water filter (if you have one!). So to make life easier, invest in a quality water filtration system which will give your terrapins a healthier environment and will dramatically reduce the amount of time you spend on cleaning... though of course this will not eliminate that effort! If you are lazy (yep… you heard it!) and don’t do this regularly enough, your terrapin may experience infections and can become very sick or even worse! But by correctly maintaining the tank, you’ll be rewarded with happy and healthy terrapins and, in fact, the terrapinarium might even become a serene focal point in your house. 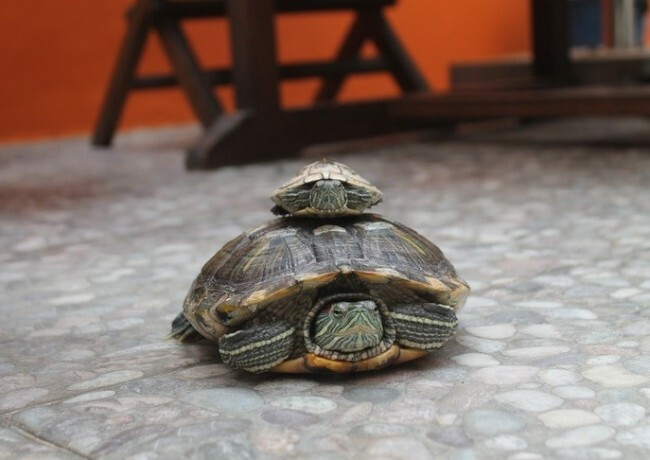 So now that you’ve been told everything you already know about terrapins (remember… the research you did :-)), you can feel even more confident that you know of everything you need to set up their healthy home. Terrapins are great little animals and if cared for correctly just might be as rewarding a part of your family as any furry kind of pet might be... without the cuddles, of course! Previous topic FAT... not PHAT! Next topic Licking, Licking, Licking... You Crazy!